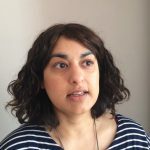 Sonali Bhattacharyya’s stage credits include 2066 (Almeida Theatre), The Invisible Boy (Tricycle Theatre), Slummers (Cardboard Citizens), Twelve (Kali Theatre), These Four Streets (Birmingham Rep), A Thin Red Line (Kali Theatre, Birmingham Rep, Black Country Touring) and the South Bank Show Award nominated White Open Spaces (Pentabus Theatre). She was one of the inaugural Old Vic 12, and is a graduate of the Royal Court Writers’ Group, the London College of the Arts MA in Screenwriting and the Orange Tree Theatre’s Writers’ Collective. She’s currently developing the musical Kali’s Toenail with support from Arts Council England, and is under commission to The Coterie.